It's February 2 and time for another round of Second on the Secondover at Bleubeard and Elizabeth's blog. I don't know if Groundhog Day is just a silly US day or not, but we will know if Punxsutawney Phil sees his shadow and hence, how long the rest of winter will last. Of course I think whether he sees his shadow or not the prediction is really the same. And for this month's second on the second, I want to share some owl photos with you. Not sure if I have shown you these before on Second on the Second, but since I had an unsuccessful snowy owl hunt this past weekend, I thought you might like to see the owls I saw back in 2014, the last time I went on a snowy owl search. 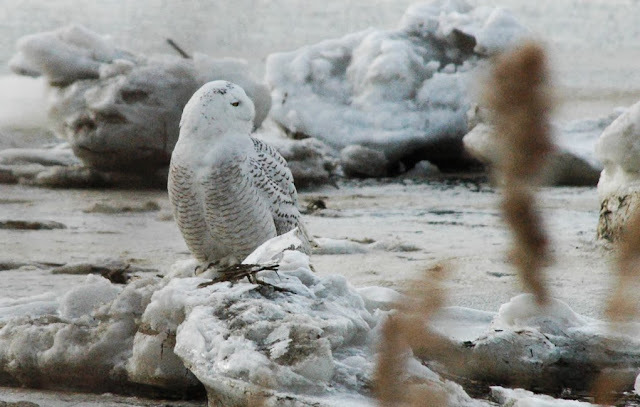 Here's a link to the original post: Snowy Owls-Feb. 2, 2014. And although I haven't done a lot of art this past week, I have been keeping up with my drawing journal. Here's a page with an animal theme that I drew last weekend after my owl search. Since the newest theme at Art Journal Journey is Animals A-Z, I am going to link my drawing journal page up. This month the hostess is Rike. 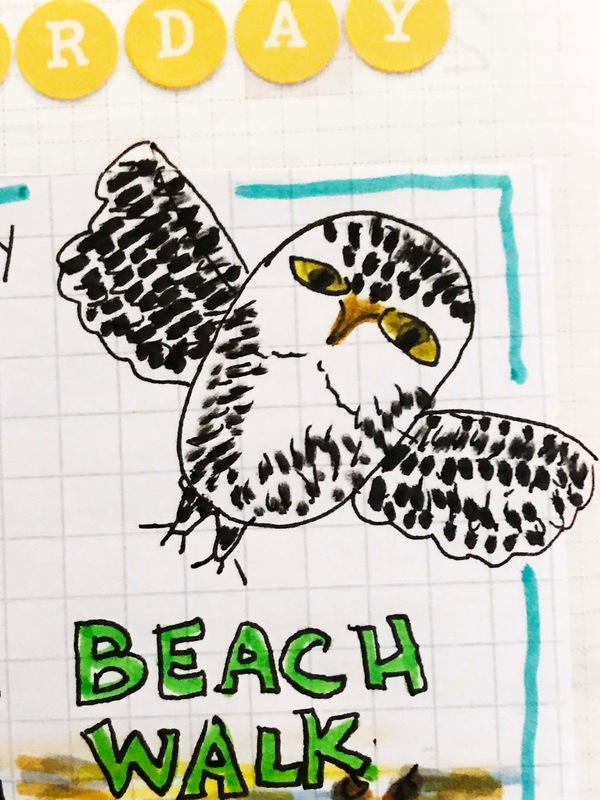 There are actually 2 types of animals on my page-the snowy owl and and the mussels (blue shells) that I drew. And I drew some dog prints too. The weekend is almost here and I am ready! 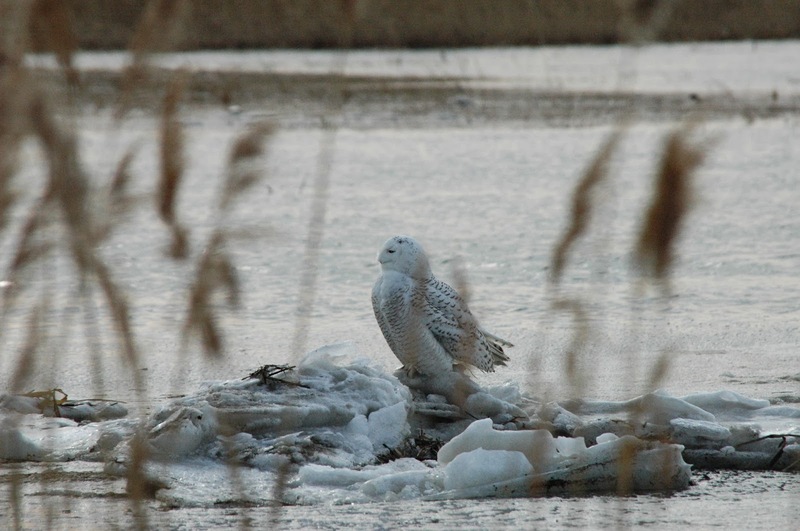 Beautiful pictures of the snowy owls. I've only ever seen pictures of them. Love your drawing journal especially the drawing of the snowdrop. Snowed here last night and snow showers today. Hope it doesn't delay the trip to the airport. Though heard home was having some nasty weather too. Happy Friday! I agree with you completely about Phil and the weather. It's not happening. No matter what he sees. I have over 60 years of experience to verify that one! I love your owl photos and both the art pieces you shared. Owls are a wonderful subject, aren't they? I need to stop trying so hard to capture a real owl and go for a happy one or one with more whimsy instead! 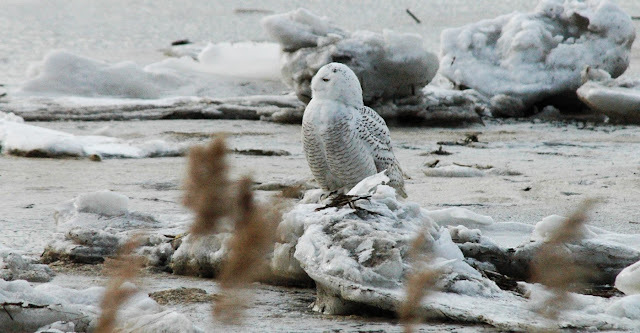 Gorgeous photos of the snowy owl! I never saw one in real life. And I don't know Groundhog Day. Thank you so much for linking this wonderful entry to Art Journal Journey! Wonderful photos of the snow owl - good you let me see them at Second on the 2nd! Happy Groundhog Dog to you as well - I didn't know about this special day until I saw the Bill Murray film in the late 90ties in German version. Your page is so lovely - you did all sketches so well and kept the memory of this lovely day! SUPER and great that it fits the new AJJ theme as well! I am quite busy with getting guests tomorrow for lunch and starting Trimester Holidays here. Thanks for sharing the wonderful photos and your lovely page! Oh how amazing to view the snowy owls-thank you so much for sharing these. Those owl photos are amazing. What a majestic animal. Your journal page is great too. (I wouldn't know how to draw an owl) Well done. Your photographs of the owls are lovely, what a wonderful bird to see, and I seriously love your painted owl with attitude (is he a baby owl?). Fun that you added mussels too. They are beautiful photos of the snowy owls, it was such a shame you didn;t get to see any on your last visit. 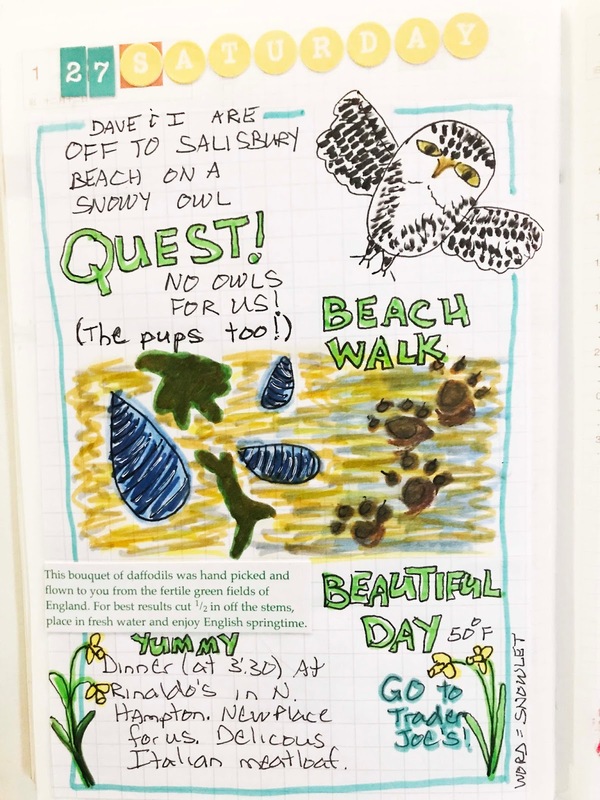 Your journal page looks fantastic and its a great sketch of the owl and I loved those pretty daffodils. I apologize for not visiting sooner. My internet (and phone) has been offline for over 14 hours. I don't remember the first time you shared the snowy owls, so this is new to me. What a lovely set of photos, and a great way to lead into your first entry at Art Journal Journey for the month. Thanks for sharing this second look back on the 2nd and thanks for sharing your great art at Art Journal Journey, too. Good evening Erika, thank you so much for your help with my stamps-I have rubber cement so will that first-and I didn't know about the sticky sheets-thanks much. Well, it was a bright sunny day here yesterday, so we will see what happens. very beautiful photos of the snowy owl and Journal, that is so wonderful fantastic creation! You got such close shots of those owls! We don't have them here. So beautiful! Wow! The owls are so beautiful Erika! I love your owl art too!